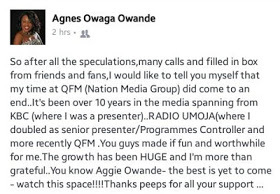 Agnes Owade who had dedicated her efforts to enthusiastically serve Nation Media Group for a decade as a radio presenter has decided to hang her boots. 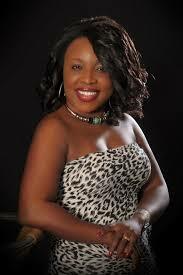 The sultry radio presenter’s abrupt exodus from NMG comes barely a fortnight after celebrated NTV’s AM LIVE co-host Sheila Mwanyigah also called it quits. The former QFM’s evening drive show host broke the news via her facebook page where she also thanked her fans for their continued support. It is alleged that NMG has sacked over 100 talented employees among them; Obinna Ike Igwe, Sanaipei Tande, Anto Neosoul and Ciru Muriuki.